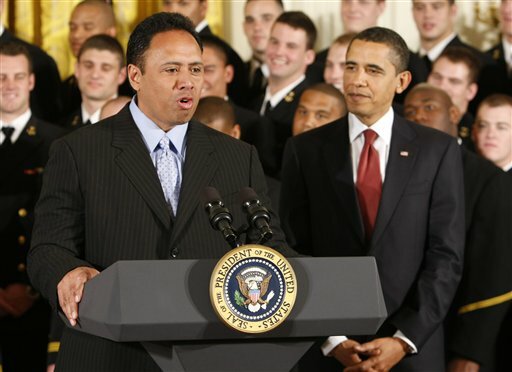 Navy head coach Ken Niumatalolo’s resume already glows: Five bowl appearances, first service academy head coach to win the Commander in Chief’s Trophy in his first two seasons, on pace to shatter Navy’s all-time win record, and the caretaker of the longest win streak over Army in the program’s history. Still, he’ll need to find room to add a line or two: The Hawaii-born Niumatalolo will join six other standouts as members of the first class of the Polynesian Football Hall of Fame. Linebacker Kurt Gouveia: Two-time Super Bowl champion with the Washington Redskins. Offensive lineman Olin Kreutz: Named to the NFL’s all-decade team for the 2000s. Offensive lineman Kevin Mawae: 16-year NFL vet, another all-2000s selection and a six-time Pro Bowler. Linebacker Junior Seau: 12-time Pro Bowler and all-1990s team member. Quarterback Jack Thompson: Left Washington State with the most passing yards in NCAA history (7,818 yards), second-best nickname on the list (the “Throwin’ Samoan”). Running back Herman Wedemeyer: College Football Hall of Famer, led the All-American Football Conference in punt-return yards in 1948, played Edward “Duke” Lakela in the original “Hawaii Five-O” TV series, best nickname on the list (“Squirmin’ Herman” or “Flyin’ Hawaiian,” take your pick). Enshrinement is scheduled for Jan. 23 in Honolulu, prior to the Pro Bowl. The Hall of Fame also will provide scholarships to Polynesian student-athletes and offer educational programs, according to its news releases.